Chura Sun Beach in Toyosaki is the largest man-made beach on the island. 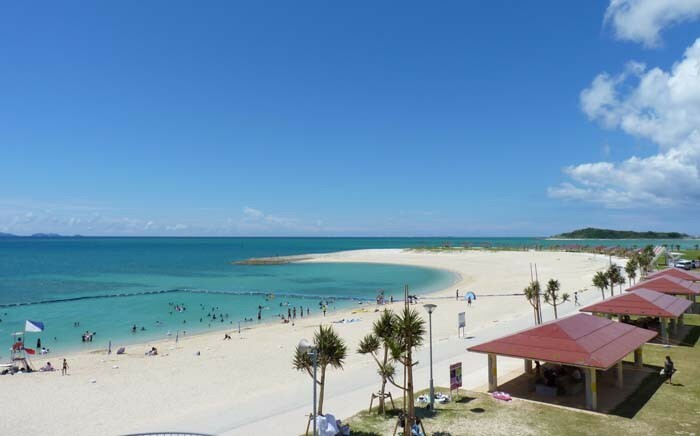 Chura Sun Beach in Toyosaki, Tomigusuku City, has the distinction of being the largest man-made beach on Okinawa. The season opening event of the beach called “We are one!” takes place this weekend. The event was first organized two years ago as a charity event for the reconstruction assistance for the Great East Japan Earthquake. This time, the event will be held with the aim of helping to counter children’s poverty. The event, which features music and dance performances, starts at noon. Performers include dancer I-VAN, sanshin player Takane Kochinda, dance group Love Junx, members of which consists of persons suffering from Down syndrome, singer songwriter YuMe, a band from Live Bar BIG playing oldies and jazz big band Nanbu Mango Party’s. A special highlight of the day is the special parade celebrating the 15th anniversary of the opening of Tokyo Disney Sea, ‘The Year of Wish’. The parade features Mickey Mouse and other Disney characters riding on a special anniversary truck ‘Dream Cruiser lll’. The parade starts at 11:00. After the parade, Tokyo Disney Resort Dream Cruiser lll is placed on exhibition to visitors from 14:00 to 17:00, for people to see the truck up close and take their pictures with it. The event takes place on Sunday, March 27th. The Beach Season Opening Ceremony starts at 9:45, the Disney parade at 11:00 and stage events at noon. The Toyosaki Chura-Sun Beach is located at Toyosaki, Tomigusuku City. Admission to the event is free. Organizers note that the beach parking area will be closed between 6:00 and 12:30 on the day of the event. Visitors can use a temporary parking lot in front of the beach instead.